موقع الدكتور كمال سيد الدراوي • مشاهدة الموضوع - Common Football Injuries? Fast Five Quiz : Are You Able to Diagnose and Treat Common Football Injuries? Which of the following symptoms differentiates grade 3 ankle sprains from grade 2 ankle sprains? involve a stretch of the ligament with microscopic tearing, but not macroscopic tearing. In general, little swelling is present, with little or no functional loss and no joint instability. The patient is able to fully or partially bear weight. stretch the ligament, with partial tearing, moderate to severe swelling, ecchymosis, moderate functional loss, and mild to moderate joint instability. Patients usually have difficulty bearing weight. involve complete rupture of the ligament, with immediate and severe swelling, ecchymosis, an inability to bear weight, and moderate to severe instability of the joint. Typically, patients cannot bear weight without experiencing severe pain. The history of an ankle sprain is usually of an inversion-type twist of the foot followed by pain and swelling. Ask the patient about the mechanism of injury, as well as why, when, where, and how it occurred. Often, however, the patient's account of the mechanism does not correlate with the structures that have been damaged. An individual with an ankle sprain can almost always walk on the foot, albeit carefully and with pain. In an individual with normal local sensation and cerebral function, the ability to walk on the foot usually excludes a fracture. Sudden, intense pain and rapid onset of swelling and bruising suggest a ruptured ligament. Suspect neurovascular compromise if the patient complains of a cold foot or describes paresthesia. Ask patients about any past ankle injuries, their goals regarding functional results, the level and intensity of their sports and activity, and their medical history. Determine the presence of any complicating conditions, such as arthritis, connective tissue disease, diabetes, neuropathy, or trauma. The physical examination confirms a diagnosis made on the basis of patient history and differentiates an ankle sprain from a fracture. The examiner should look for areas of tenderness and swelling. The maximal points of tenderness for a lateral ankle sprain should be at the ATFL and/or CFL ligament areas. Ecchymosis may be present and may be tender. The degree of swelling or ecchymosis may be proportional to the likelihood of fracture. Note, however, that blood usually settles along the medial or lateral aspects of the heels. Thus, the location of the ecchymosis may not correlate with the location of the injury. In addition, prompt treatment with ice, compression, and elevation of the ankle may reduce swelling and ecchymosis; thus, these findings do not necessarily correlate with the severity of the injury. No bony point tenderness should be present; particular attention should be given to the medial malleolus, lateral malleolus, base of the fifth metatarsal, and midfoot bones. Point bony tenderness at one of these areas, as well as bony deformity or crepitus, suggests the possible presence of a fracture. Pain localized to the medial aspect of the ankle suggests a medial ankle sprain. Active ROM must be assessed, because Achilles tendon ruptures can mimic ankle sprains. In lateral sprains, passive inversion should reproduce the symptoms. Plantar flexion should also exacerbate the symptoms, because this motion stretches the ATFL to its maximum. Anterior drawer and talar tilt examinations are used to assess ankle instability; however, the use of these tests in acute injuries is in question because of pain, edema, and muscle spasm. For the anterior drawer test (as shown in the image below), the patient's knee must be flexed to relax the gastrocsoleus complex, and the foot should be in 10° of plantar flexion. Grasp the heel and pull forward while, with the other hand, providing counterpressure over the front of the tibia at the level of the ankle. A firm endpoint will be absent. Repeat these steps for the other ankle, and compare results. In a person with lax joints, the presence of several millimeters of bilateral movement is a negative ankle drawer-sign finding. In a positive ankle drawer-sign finding, there is a difference in movement in a relaxed patient between the injured side and the uninjured side, with the injured side having more movement than the uninjured one. Sometimes, a dimple appears over the area of the ATFL on anterior translation. This so-called dimple (or suction) sign indicates compromise of the ATFL. It may be accompanied by pain, but muscle spasms are minimal. The anterior drawer test is not very reliable, especially if the findings are negative in a patient who is not under anesthesia, because of muscle guarding by the patient. The normal amount of translation is 2 mm. Reports indicate that 4 mm of laxity in the ATFL provides a clinically apparent test result. The prone anterior drawer test is another test for ligamentous instability. The patient must lie prone with the feet extending over the end of the examining table. The examiner then pushes the heel steadily forward with one hand. A positive test result consists of excessive anterior movement and a dimpling of the skin on both sides of the Achilles tendon. The talar tilt test, or inversion stress maneuver, is performed with the patient supine or on his/her side, with the foot relaxed. The gastrocnemius must also be relaxed by flexion of the knee. The talus is then tilted from side to side into adduction and abduction. The findings should be compared with those for the contralateral side. Abduct and invert the heel. If a firm endpoint cannot be felt when compared with the opposite ankle, suspect damage to the CFL. Note that the degree of tilt ranges from 0-23°. In many cases, this test is difficult, if not impossible, to perform secondary to patient pain and swelling. The exam is demonstrated in the image below. The external rotation test can demonstrate the integrity of the syndesmotic ligaments. The patient sits with the knee flexed to 90°. The foot is gently grasped and rotated laterally with the ankle locked in neutral. A positive test result occurs when the patient has pain over the syndesmosis. The external rotation test has a sensitivity of 20% and a specificity of 84.8%. A variation on the external rotation test is the Kleiger test. This test can demonstrate the integrity of the deltoid ligament. The patient sits with the knee flexed to 90°. The foot must be relaxed and not bearing weight. The foot is gently grasped and rotated laterally. A positive test result occurs when the patient has pain medially and laterally. The talus may displace from the medial malleolus, indicating a tear of the deltoid ligament. The fibular compression test, or squeeze test, is used if a syndesmotic or fibular injury is suspected. To perform the squeeze test, place the thumb on the tibia and the fingers on the fibula at the midpoint of the lower leg; then squeeze the tibia and fibula together. Pain down the length of the fibula indicates a positive test result. Note that pain should not be felt at the site of the pressure but rather in the lower leg. 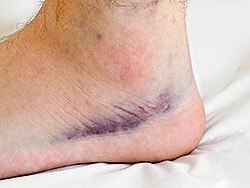 A positive test suggests a high ankle sprain (which involves the syndesmosis and tibiofibular ligaments and usually takes longer to heal than a lateral ankle sprain) or a Maisonneuve fracture of the proximal fibula. The squeeze test has a sensitivity of 30% and a specificity of 93.5% for a high ankle sprain. As with all limb injuries, the neurovascular status of the limb must be assessed. This assessment consists of palpation of the dorsalis pedis and posterior tibial arterial pulses. Testing for sensation, especially over the sural nerve distribution, is also necessary; sural nerve and peroneal nerve palsies, although rare, may complicate a lateral ligamentous injury. Electromyographic examinations of individuals with severe ankle sprains have shown that 80% of these patients have some degree of peroneal nerve injury. Grade 2 injuries stretch the ligament with partial tearing, moderate to severe swelling, ecchymosis, moderate functional loss, and mild to moderate joint instability. Patients usually have difficulty bearing weight. Grade 3 injuries involve the complete rupture of the ligament, with immediate and severe swelling; ecchymosis; an inability to bear weight; and moderate to severe instability of the joint. Typically, patients cannot bear weight without experiencing severe pain. Ankle sprain staging or grading is primarily done clinically. The clinician can determine whether the ankle ligaments are stretched without significant tear (grade 1), are partially torn (grade 2), or are completely torn (grade 3) on the basis of the degree of swelling and ecchymosis and on the clinical stability of the ankle. Arthrograms, stress radiographs, and magnetic resonance imaging (MRI) scans add little to the management of the ordinary ankle sprain. In order to have any significance, stress radiographs should be performed on both ankles. This grading system fails to characterize ankle injuries involving 2 or more ligamentous structures and excludes consideration of nonligamentous injuries. Functional instability of the ankle has been defined variously as the occurrence of frequent sprains, difficulty running on uneven surfaces, difficulty cutting or jumping, and recurrent giving-way for at least 6 months despite adequate nonsurgical therapy. Instability may result from tibiotalar laxity or subtalar instability. Patients with subtalar instability may report giving-way symptoms of the foot during activity and a history of recurrent instability, pain, swelling, and stiffness. The symptoms are often vague, and distinguishing between subtalar and tibiotalar instability is difficult. Patients may also have pain over the sinus tarsi or deep pain in the subtalar area. This sinus tarsi syndrome can be a component of subtalar instability, with tenderness to palpation over the sinus tarsi and pain upon forced inversion of the foot. Increased internal rotation of the calcaneus is also a common finding, and excessive distal displacement of the calcaneus may occur in relation to the talus compared with the normal side. Subtalar instability should be regarded as contributing to the patient's symptoms, especially in a high-energy injury. Chronic medial ligament instability is uncommon, but it produces discomfort on the medial side of the ankle and is associated with slight valgus and abduction of the ankle with each step. An individual with an ankle sprain can almost always walk on the foot, albeit carefully and with pain. In an individual with normal local sensation and cerebral function, the ability to walk on the foot usually excludes a fracture. No bony point tenderness should be present; pay particular attention to the medial malleolus, lateral malleolus, base of the fifth metatarsal, and midfoot bones. Point bony tenderness at one of these areas, as well as bony deformity or crepitus, suggests the possible presence of a fracture. Suspect neurovascular compromise if the patient complains of a cold foot or describes paresthesias. Bone tenderness in the posterior half of the lower 6 cm of the fibula or tibia and the inability to bear weight immediately after the injury and in the emergency department are indications to obtain radiographic imaging. Intra-articular meniscoid lesions represent localized fibrotic synovitis in the lateral ankle following inversion sprains; the condition also is known as impingement syndrome. Peroneal tendon subluxation is due to detachment of the peroneal retinaculum from its normal insertion on the posterior border of the fibula to the lateral surface of the fibula. Talar dome fracture occurs with inversion and eversion injuries, but it may not be readily seen on radiographs. Anterior process fracture of the calcaneus occurs with inversion injuries. Patients commonly display bony tenderness rather than ligamentous point tenderness. Complex regional pain syndrome (CRPS), or reflex sympathetic dystrophy, can develop after ankle sprains. The reason for this is unknown; however, the condition may arise from an abnormal response to disuse and/or splinting of the foot and ankle. Early, controlled activity and rehabilitation may prevent the development of CRPS. Active ROM must be assessed, because Achilles tendon ruptures can mimic ankle sprains. Extensive swelling, ecchymosis, or pain may suggest an osteochondral lesion not observed on plain radiographs. CT scanning is useful for evaluating osteochondritis dissecans and stress fractures. MRI may be useful when osteochondrosis or meniscoid injury is suspected in patients with a history of recurrent ankle sprains and chronic pain. A bone scan can detect subtle bone abnormalities (eg, stress fracture, osteochondral defects). A bone scan can also detect syndesmotic disruption. Plain radiographs may be clinically indicated to diagnose a fracture of the ankle or foot. Ankle stress radiographs contribute little to the management of acute ankle sprains because surgical treatment of the acute sprain is rarely indicated. Abnormal swelling or clinical ankle instability in an acute sprain may be documented with bilateral stress radiographs of the ankle. MRI is not indicated unless unusual features are present, such as extensive swelling, ecchymosis, or pain, that suggest an osteochondral lesion not observed on plain radiographs. Even if MRI scans demonstrate bone bruising or actual articular cartilage damage, conservative ankle sprain treatment is indicated initially.